Text mode programming ain't dead yet! 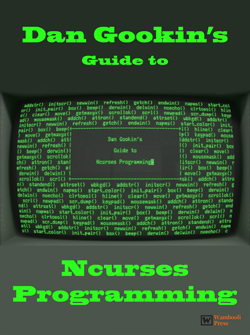 This page supports my eBook Dan Gookin's Guide to Ncurses Programming. It's available in Kindle eBook format as well as paperback. For support on the earlier print book, The Programmer's Guide to Nurses, click here. * Here is a link to a page on using Python with Ncurses courtesy of the Npyscreen python widget library and application framework. GNU NCurses web page - How to get NCurses, options, features, and so on. Thomas Dickey's NCurses FAQ - General questions about NCurses itself, plus a few links to some How-Tos.